Readymades in the Social Sphere: an Interview with Daniel Peltz | continent. Since 2008 I have been closely following the conceptual/performance/video work of Daniel Peltz. Gently rendered through media installation, ethnographic, and performance strategies, Peltz’s work reverently and warmly engages the inner workings of social systems, leaving elegant rips and tears in any given socio/cultural quilt. He engages readymades (of social and media constructions) and uses what are identified as interruptionist/interventionist strategies to disrupt parts of an existing social system, thus allowing for something other to emerge. Like the stereoscope that requires two identical images to create an illusion of a three-dimensional image, Peltz sometimes visualizes two separate elements to create an object or moment that requires space and depth to focus on its varied layers. They say your brain has to process and make meaningful sense out of all that visual information before it can accept the illusion. I say your brain has to do a similar thing when looking and seeing the divine, magical, and faithful (social) art making of Daniel Peltz. Daniel Peltz is Associate Professor of Film/Animation/Video at RISD. He divides his time between Rhode Island and Sweden and is currently at work on an exhibition at Botkyrka Konsthall, Stockholm opening February 2013 and a new project to be included in the IASKA: Spaced Biennial (Australia) in 2014. This interview took place on Skype and is part one of a two-part interview. Feliz Lucia Molina: Are you in Providence, RI? Daniel Peltz: I’m at my house in Providence. I’ve been back for six days teaching winter session at RISD and doing this workshop series—these investors’ drum circles with a group of wealth managers. FLM: The wealth managers were all drumming together? DP: They were all drumming in response to the performance of their retirement portfolios. FLM: Is this part of the “Unrealized Gain/Loss” piece? DP: Yes, it’s part of a show I’m working on in Sweden. I can show you because it was just today. I’ll show you some of this. Lets see—share screen [click, click, click]. This is the room. 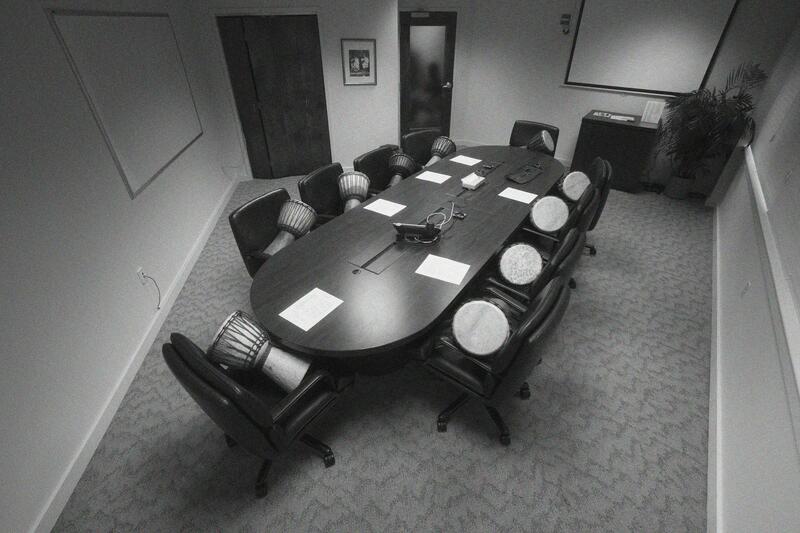 I’ve been using the camera system that’s already installed in the conference rooms to record them. 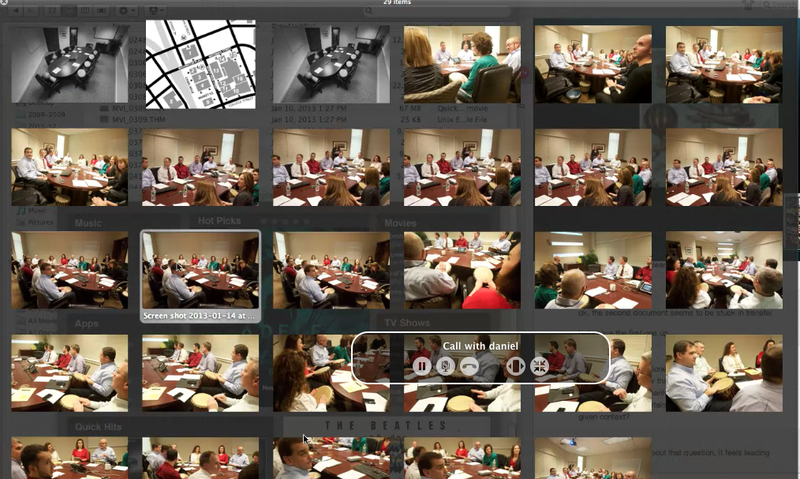 So the video is being recorded directly by the wealth management office’s tech staff. These are the people I worked with in the last workshop. This conference table is less wondrous. They’ve been learning to drum in response to their retirement portfolios. I started by bringing in my little bit of wealth for them to propose a management strategy, I came to the follow-up meeting with a counter proposal, which was this workshop. So they agreed to do this series of workshops instead of managing my wealth. FLM: Does everybody in the room manage your wealth? That’s kind of a lot of people. DP: That woman in the back there and Craig —they handle new client business. So when you come there with your wealth, they sit down with you and suggest to you how they would manage it. They’re very nice, responsible people. FLM: And where is this? DP: This is in Providence and the one I was showing you is in Waltham, where I was today. Then I’m going to Newport for the last one on Friday. So I will have done four of them. This is the group in Waltham that I just played with today. I played directly with the two groups in Providence and I’m working with an ethnomusicologist at Brown, Asha Tamarisa, who is facilitating the last two. She’s helped develop the workshop in terms of figuring out how to train a group to do this and thinking about the compositional challenges of working in response to retirement portfolio data. FLM: Screensharing helps me to figure out tiny bits here and there about the project. DP: I might even be able to play you a little of the audio I’ve also been working with a group of professional percussionists on what will become a quarterly public investors’ drum circle event. Their stuff was really nice, but I want you to hear what we sounded like in the workshops. They’ve all been recorded by the a/v system in the offices. We use a simple structure where the drummer investors interpret the sensation of gain or loss as embellishments to a base heartbeat rhythm. The group holds the heartbeat and, as each person experiences gain or loss, they embellish that rhythm. "Screensharing helps me to figure out tiny bits here and there about the project"
FLM: Is the process all very spontaneous? DP: Its actually quite structured. We produce a custom stock ticker that shows the performance of their collective portfolios. In advance of the workshop each participant submits assets in their retirement portfolio. Then we make a stock ticker that shows the real-time performance of their assets so that they can respond to almost live data. FLM: Are they reading the stock ticker projected up on the screen in the room? Do people drum in correspondence to the visual live data of the performance of their assets? DP: Exactly. They’re looking at the stock ticker as opposed to each other, so it’s a slightly shifted drum circle. They’re looking at the ticker but they’re listening to each other—that’s what we’re practicing. For example, NVO—the price is 172.08 but it’s down -1.16 and as that moves across the screen, the person who’s retirement is invested in that asset starts to embellish when that arrow first appears, based on their experience of loss. They stop when it exits the screen and return to the heartbeat. You could have one ticker for each retirement portfolio, but the way the workshop is constructed is that we just isolate one asset from each person’s portfolio so that everyone in the group is represented in a single ticker. So they’re drumming and looking at the ticker, but they’re hearing each other experience gain and loss. We’ve removed direct visual engagement from the social structure of a drum circle but the oral engagement is still there. FLM: So they had their own sound interpretation of gain and loss? DP: Yeah and that part is quite spontaneous as you were saying. In some of the preparatory exercises we’ve been working to give the participants more strategies for interpreting the sensations of gain and loss. We’re trying to develop their capacity to embellish a heartbeat or base rhythm but I’m not invested in having a melodious result. I’m quite curious about what this kind of structure will result in without any desire for a particular result. FLM: For context, can you talk about the project you did a couple years ago in Bali, “Unrealized Gain/Loss” in relation to this current wealth management project? DP: The workshops I’ve been doing use a similar strategy to the other components in this project. It started in Indonesia on my sabbatical and I was really trying to understand where I was physically and where I was being on sabbatical—this kind of strange jubilee structure where every seventh year you’re supposed to renew your self. And it was around the time of the global financial crisis. I was on sabbatical for the global financial crisis. I remember watching my father, in particular, respond to the financial crisis by monitoring his retirement portfolio and trying to make sense of it. I realized on a visit to their home that he checked his retirement portfolio every single day and I was really struck by that because in some way our parents are mysteries to us as children, especially their moods. We know how important their moods are but we don’t know what governs them. And somehow it was like I’d figured it out, it’s the performance of the DOW! So I think there was something in that. Then I was in Indonesia and I had been drawn there by an interest in their highly ritualized Hindu culture, where so much of life is driven by a ceremonial calendar. I was interested in Bali as this predominantly Hindu pocket within a predominantly Islamic country and life there being organized by this ritual calendar functioning as a kind of resistance to the dominant global religion of free-market capitalism. So I started to explore that correlation between the ways in which this culture that I was living in was sort of “living for the afterlife” and this idea within certain segments of American society of “living for the afterwork life”. The idea that your wellbeing in the “afterwork life” is tied to forces that are unseen and largely beyond your control has strong similarities to many religious understandings of the universe. So I started to explore that and the crafts and materials that were around me were primarily Batik and percussion. Percussion is a huge part of daily life in Bali. These gamelan troupes were everywhere. And I also happened to be there for Nyepi, the day of silence, which is preceded by a very elaborate procession and construction of demonic statues. These were the things that were around me and I started studying Batik with one of the Batik artists there and also started a conversation with two master Batik artists, one who is American and her Indonesian husband. I developed these patterns that were based on symbols from the performance of my retirement portfolio and worked with the batik artists to produce two sarongs. In producing the designs, I treated the performance of my retirement portfolio since my arrival at RISD [7 years] as a significant interval and then I looked at the ways in which decisions are made within retirement portfolios as having an extension outwards from the individual assets that underlie the retirement portfolio, which are kind of like the base elements of the retirement world. Then there’s the allocation of your assets, which is a global way of understanding an individual according to typologies, which are often referred to in terms of risk—this notion of a ‘risk profile’. What type of ‘person’ you are is determined by your attitude towards risk, or potentiality, and I found that to be a really fascinating way of understanding the universe. I remember looking at the tabs in my retirement portfolio and finding this one for viewing ‘Unrealized Gain/Loss’ and that’s often how I work—is just going through the Cambridge Parking Code, for example, and finding this section of the code that was called ‘Crossing Non-Signalized Locations’ and just feeling “I can’t do any better than that,” you know? That’s what I was talking about in terms of ready-mades that exist in the social sphere. Pulls out a TIAA-CREF brochure with a man in a suit seated at a table. This guy is probably an actor, and [the brochure] says “TIAA-Cref announces “Individual counseling sessions at the Rhode Island School of Design. Individual counseling sessions at no additional cost to you. You can discuss your personal financial situation with an experienced TIAA consultant on a confidential basis. We are available to help you discuss how to achieve your financial goals by investing in financial solutions such as mutual funds, brokerage, life insurance, and annuities...etc....What retirement benefits best fits your situation?” Often I encounter this and I think O.K., this is one way to prepare for the after-work life and it seems inadequate to me. But, I also find it really inspiring. I really like the visual language of it. I kind of want to be that man. I’d like to see if I could maybe buy his clothes. FLM: What it is about the man on the brochure that interests you? DP: He’s offering personalized objective advice and a detailed evaluation of everything you need to know and do. Who wouldn’t want that? But he’s also something of a contemporary priest or priestess, mediating between the unseen all-powerful universe of global capitalism and the common worker. So I started off developing Unrealized Gain/Loss directly from the charts that represent the performance of my retirement portfolio. Then I came home and I wanted to use those. I had this word in my journal “unrealized gain/loss vessel.” I had this notion of vessels that would contain unrealized gains and losses. That felt really important to me that they would have somewhere to go. I had been thinking a lot about altars and making offerings—that somehow this really fickle, massive, difficult-to-comprehend-universe of the financial world—that somehow it might be nice if you could making an offering to it. [In Bali] they made such beautiful elaborate offerings. So I studied offering making as well with one of the women there and she taught me some of the standard forms created by folding leaves and the significance of the floral arrangements. 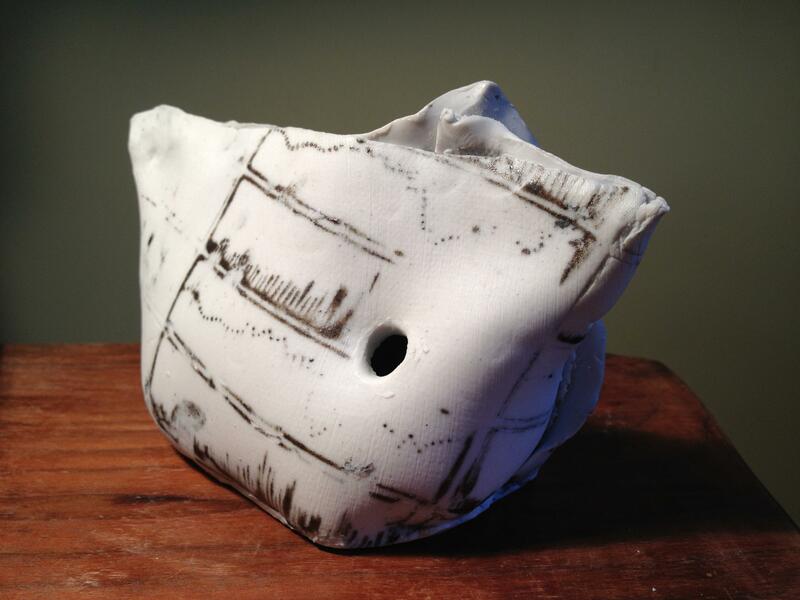 I started working in clay and then moved to porcelain and I made these unrealized gain/loss vessels. I made a few of them, they have holes on either side that you can’t get your fingers in. But something can go in there and something can go out of there. It’s a nice size for putting on an altar. Then I got this commission from Artists in Context who was interested in my doing something for this project “Artists Perspectives for the Nation” project. I proposed initiating these investors’ drum circles as a new public performance form. I’m interested in bringing together those two symbols—the symbol of the djembe and the drum circle. FLM: I can imagine the public digital stock ticker performing like a soft fleeting stream of information, a kind of (meaningless) illusory comfort blanket. DP: In some way you have to understand its relevance outside of the obvious, right? Because the obvious is illogical. Nobody is actually using that data to day trade, for example. People aren’t sitting there with their computers watching the market data in Times Square or setting up an outdoor office and being like “OK it’s up 3 points or it’s up 1.56, trade! Ok now buy, Ok now sell!” That would be a kind of a nice performance, actually. But actual day traders would want more up to date data than that. To understand what that data is doing is really important. And that’s something I’ve realized—that I’m interested in a particular kind of data visualization, which is not about what data can tell people, but what data can tell people who are visualizing it. For example, in the Cambridge Project “Crossing Non-Signalized Locations” I was interested in the 10,000 excuses archive of data recording five years worth of excuses for why people thought they shouldn’t have received their parking ticket. I was not interested in making that excuse wall so that the public could see and understand this data. Inevitably the data will be seen by others but I was really interested in what the action of visualizing the data told those who were visualizing it. The parking attendants themselves were writing those excuses on the wall—I was interested in what that kind action of writing the excuses on the wall told them about the data. Similarly, I’m interested in designing a way to allow people to pass this data from the unseen universe of the market, through their own bodies, which happens through the merging of the drum and the stock ticker. I’m interested in those two also as symbols; the drum as this symbol of the earth, the body and a pagan counterculture, and the stock ticker referring to the ethereal world of global markets—bringing those two together and making them dependent. I’m often drawn to conceptual propositions that I become invested in testing in a sincere way—at first they often they sound humorous to others, but I have to remember that there is humor in them. I don’t sit around and laugh about these things. I stop finding them funny at all. I’m interested in the proposition that we could know something about the after-work life by drumming in response to our retirement portfolio. So then I become really interested in how to craft that into a viable performance form for myself and others. FLM: The aspect of using sound in “Unrealized Gain/Loss” as a way of embodying the information to the asset holder is really intriguing—using sound as a means of embodying the asset data. Was sound a medium that made sense to use immediately or were you considering other means of attempting to embody it? 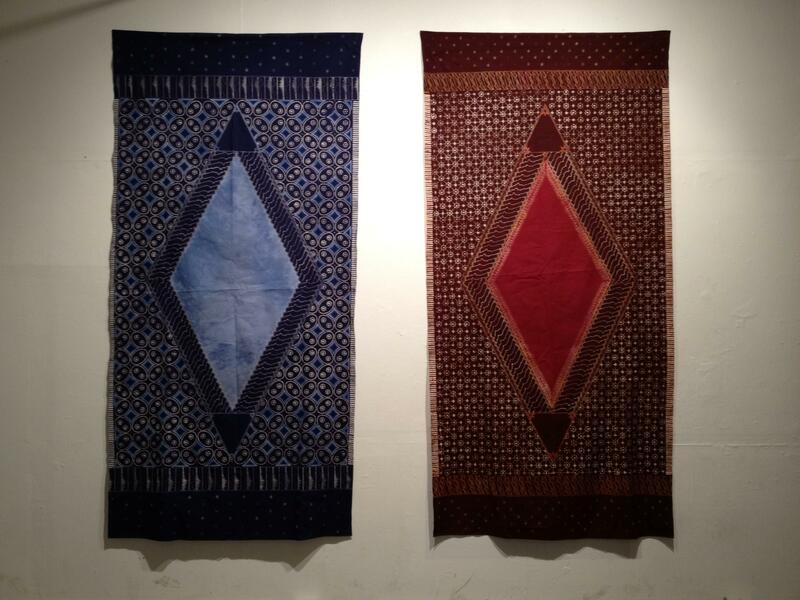 DP: Well I do use other mediums within the project like textile, ceramic, and batik patterns. I was first drawn to the history of Batik patterns as a socio-economic stratification system and the vessels as a way of embodying or manifesting this data of unrealized gain and loss. My first approach was to work with meditation actually—a meditation workshop with my colleagues. I was going to offer this “Unrealized Gain/Loss” workshop where you would explore the sensations of gain and loss by adapting the way yogi-nidra brings you into contact with your physical surroundings and stretches your perception. FLM: At Naropa University there are/were business & compassion workshops—a sort of mash-up of business and compassion and how compassion could be incorporated into a business model. This process and engagement of “embodying data” also has to do with “Participatory Democracy and the Future of Karaoke” you created at the DNC in Denver in 2008. DP: That kind of appropriation and instrumentalization of spiritual practice could be disturbing and thus compelling as a strategy. For various reasons, I’ve come to be drawn to both the form of a quarterly public performance and the established performance form of a drum circle. Its something I’ve seen myself do before, that is to mess up a really good functional social system like a drum circle or karaoke. I remember I was developing language for the karaoke project and started calling it “Participatory Democracy and the Future of Karaoke” and one of my assistants on the project, who’s an incredible artist, said, “but don’t you think the future of karaoke is guitar hero?” and I realized that maybe he thought I was trying to improve the form. I’m just trying to get people to have this shifted embodied experience, I need to craft the performance context so that they can do that. In the case of the karaoke project, for example, what did I need in order to be able to do this [a person to stand up in front of a bar and deliver a karaoke speech]? I realized that the body is very vulnerable so I built a podium so that the speaker can feel secure enough to do this, otherwise you couldn’t get to this state achieved by passing these speeches through the body. Then I was, like, well you need to be able to practice the lyrics because you don’t know all the “songs” by heart, which became an insert to the massive track books carried by most karaoke VJs. And then sometimes the crowd in the bar isn’t there with me, so I needed to extract the voice of the crowd cheering from the original venue and I needed the local audience to cheer if they wanted to. I’m interested in both where the form succeeds and fails. In particular, one of the most interesting things is this auditory gap between the space where you are, the reduced scale of applause in your own little bar, and this grand scale of applause at the convention center where the speech was originally delivered. FLM: How did the concept of “Participatory Democracy Karaoke” come about and why did you use karaoke as a means of engaging what was happening at the DNC in 2008? DP: I was looking at a lot of different readymade media infrastructures within the city at the time. I was interested in the emergency broadcast systems and I developed a proposal to repurpose that system and karaoke became an important symbol because it was this populist form that was already engaged in exploring the sensation of celebrity but also visualizing the gap between ourselves and those with more power and influence. So it had this readymade capacity to play with power and celebrity and I felt like the Obama presidential campaign, the first one in particular, had some very curious overlaps with this culture of celebrity. Obama of course rose to power partly based on his oratory abilities and I was interested in how karaoke as a vehicle was so adept at offering people all that was left of authentic expression in a political speech. Managing a politician and constructing their identity is such a developed practice that it becomes, kind of automatically, a metaphor for the way that our own identities are constructed. Of course the Obama campaign was very hip and savvy and deploying this notion of grassroots. It was really pioneering in its use of social media and this deployment of notions of populism. I was interested at that time in the capacity of karaoke to track speech patterns, precise tempos of anyone’s delivery, and that to me was a way of thinking about what might be left of the authentic self. I was interested in karaoke’s capacity to extract that authentic component and offer it to others. So not just to stand up and be them, but to [literally] pass their speech patterns through your own body. FLM: A kind of magic takes place in that incongruency between sound and image and the karaoke participant who’s relaying the speech-text at the same time. DP: Exactly and there’s some kind of truth in that experience of reality. FLM: Yeah, there’s something uncanny about seeing the body close-up like that as though it can’t lie to you in that moment or context. It’s a weird moment of luminous clarity. The work you’ve done and all of what you’re saying about karaoke is so very interesting to me. Growing up, my dad and uncles sang karaoke a lot (and still do) and being first-generation Filipino American is a different cultural subtext entirely. I’m also seeing it from the position of witnessing family members who are carriers of these stories and songs. And seeing them cherish these Tony Bennett, Frank Sinatra, Elvis Presley songs so much, I also see how their bodies are literal vessels of popular music that signifies something greater—it signifies their cultural and socioeconomic place in the world. The way that they cherish these American 1950s and 1960s pop songs is similar to having a certain kind of reverence for their spiritual faith or Catholicism. It’s a similar kind of care, focus, and attention exerted in karaoke and Catholicism—that these two structures and systems give something to focus on. DP: Sure there something about the relationship we have to our candidate or the way we go about choosing a candidate, which is very similar to a deity or idol. I learned a lot about karaoke culture through this project. I’d never done karaoke. 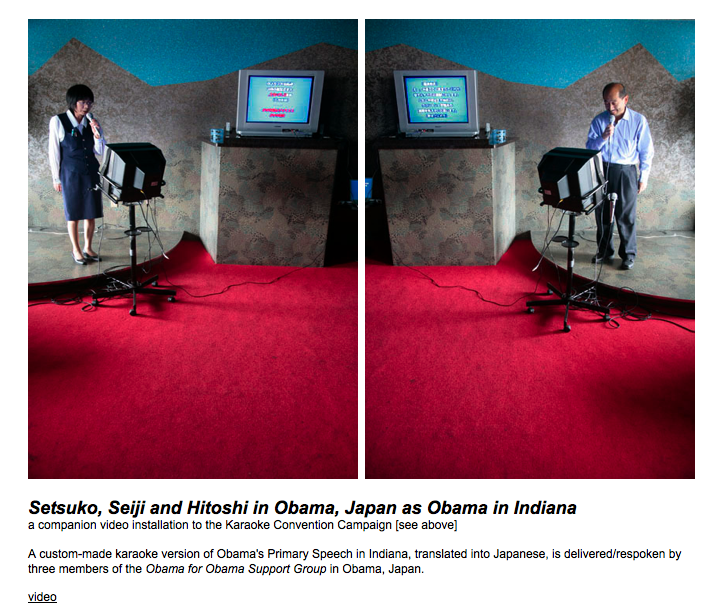 I’d never been interested in it as a form and then I travelled to Japan as part of the project when I made “Setsuko, Seiji and Hitoshi in Obama, Japan as Barack Obama in Indiana” and it was quite fascinating because my image of karaoke had always been this very public forum in a karaoke bar and then I discovered there’s this whole other world of karaoke where people even go on their own, they go and rent a room or cubicle and sing, or they go on a date—just the two of them go and sit in a room and do karaoke together. FLM: I’m interested in issues that take place within or as a result of specific karaoke culture(s). In the Philippines within the last several years there’s been occurring the “My Way Killings” phenomenon. Apparently baklas or gay men are employed by karaoke establishments to help “smooth over conflicts over karaoke singing”—these social forms of conduct, or lack thereof that arise out of the infrastructures of this social sport. In this one rural part of the Philippines there’s a village karaoke machine that the whole village shares—the Aeta indigenous people have an appointed “keeper” of the karaoke machine. I also see karaoke as a proxy to the confessional box in Catholicism where one goes to pour out their sins (minus the penance and redemption). The karaoke machine enables one to literally sing out whatever’s going on internally, but through highly saturated popular song lyrics. While karaoke is a public and social sport, it can also be a private one. Karaoke is a means of communion with each other. DP: Right, this preference for this kind of mediated communication. In Japan I was trying to organize people to work on this project and I was talking about throwing a party and they were like, well, we have to rent a karaoke machine because what else are we going to do? And I think its kind of serving that function of surrogacy—emotional surrogacy. FLM: And karaoke tools can be read as ritual tools—the magic mic that holds everything. There’s got to be some overlap at some point—between religious ceremony and devotion to the karaoke machine. DP: The way I designed the piece was so that it could slip right on top of the ready-made karaoke infrastructure. There was a flat-packed podium and it was made of a single sheet of plywood with no fasteners that slotted into itself. Those were sent out to a network of karaoke bars that I invited to become “karaoke convention centers.” The local VJs downloaded our custom-made, speech-extracted tracks that were designed to play on their existing equipment. In this sense the piece is a permanent installation. If you go to Denver today, some of the VJs still have the tracks in their library of offerings, the Ramones and Romney. It was this notion of re-purposing readymade infrastructure to create a distributable populist form. Obama was coming and the convention was in the Pepsi Center and 30,000 people were coming including 10,000 journalists. The impetus behind the larger art project that commissioned international artists to make works in Denver, was that local people weren’t going to have much access to this convention. It was like an invasion, the city was being descended upon, but if you lived a block away from the site, you had the same access as people in Zimbabwe&mash;30 second media bits excerpted from the speeches. So it seemed to me that the fundamental gesture was how do I take that signal, which was travelling out of the convention center, and create a local interruption? FLM: Is that what you mean by ‘intervention’? The term is frequently used to help describe your work. FLM: So the interventions or interruptions aren’t necessarily adding or subtracting, but are they putting orange cones there? What are they doing exactly? DP: I think you’re right about that, they’re not really subtracting. They’re adding to the scope of possibility. I’ve been thinking (with this exhibition I’m mounting next month) about the work as explorations and expansions of social possibility. Maybe it’s more insertion. I started calling the pieces ‘insertions’ that I was making in Rejmyre—a small town in Sweden where I’ve been working for six years now. 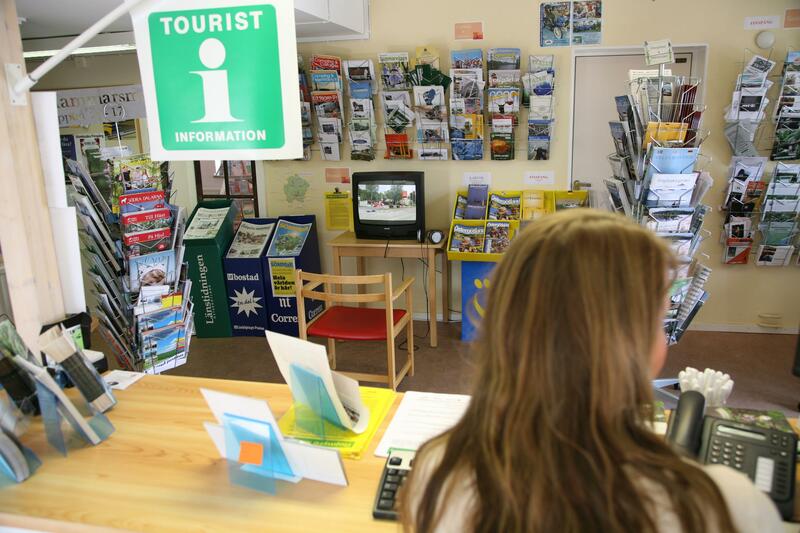 My favorite site to install there is the tourist bureau. I started calling the video pieces that I made for the tourist bureau, video insertions. This idea that you’re inserting something into the readymade media infrastructure of the world resonates with me. Insertion leverages a context, creating a possibility that the inserted object might be naturalized in the process — that someone can encounter my video in Rejmyre as tourist information. And then all of a sudden tourist information can include some American guy prostrating through town and it can include really bad relationship advice. Maybe insertion is a better word.